This evening Nest CEO, Tony Fadell, took to the stage to announce a refresh of the companys entire product lineup. First up was Nest Version 2.0, a software update with a big focus on improving safety. Your Thermostat will now talk to Nest Protect (the company'ssmoke alarm. ), so if it detects high levels of carbon monoxide in you home, Nest can shut the leaky heating system off. Similarly, if your Protect detects smoke, Nest will shut off the heating to stop the flames from being fanned around the house. You'll also get notifications for extreme temperatures, so if you're away from home and your house experiences a cold snap, you could turn the heating on to prevent pipes from freezing. All of this added functionality will come to existing Nest products with a free software update coming later in the year. Next up was a new Nest Protect. This smoke alarm is redesigned aesthetically, and it's smarter than the previous version. The new Nest Protect is 11-percant smaller than the previous version, with a rounder, more friendly design. The device now comes packing a split spectrum sensor, which the company claim is better at detecting false alarms (such as burning toast, or a steamy shower). As well as these key features, the Protect is also easier to mount on the wall or ceiling, with the ability to test and silence the alarm from your smartphone. The new Nest Protect will be available to buy for £89 RRP, and will begin shipping next month. Then we were shown the Nest Cam, not exactly a secret thanks to online leaks, it's a redesigned and improved Dropcam. 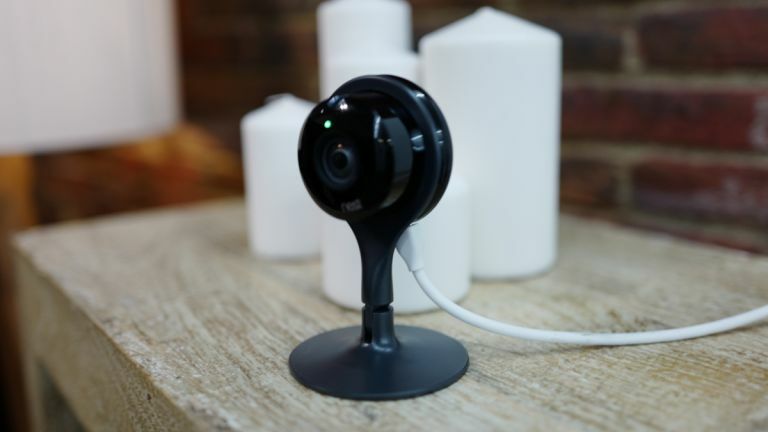 The Nest Cam features a lightweight, magnetic Zinc alloy stand with a tripod mount, allowing you to mount the IP cam in various locations around your home. Video quality has also received a boost, now streaming 1080p Full HD video across the net. Users can make use of 8x digital zoom, and a better night vision implementing eight infrared LEDs for better room coverage. The camera also functions like a walkie-talkie, with two-way audio. To get the most of Nest Cam you'll want a Nest Aware subscription which costs from £8 per month for one camera (or £80 for a year). This comes with DVR functionality, 10-day video history and advanced motion detection. The Nest Cam will cost £159, available next month, and comes with 30 days of free Nest Aware. All Nest users will also get an updated app, now version 5.0, which is nicer to look at and easier to use. Finally, the company showed us a really innovate new initiative which works with Insurance companies. You'll soon be able to let your home insurer know if you've got a Nest Protect smoke alarm installed, if it has batteries, and if it's connected to WiFi. This will reduce you annual home insurance premiums by 5-percent. It's called Nest Safety Rewards, and it's an opt-in programmewhich allows you to choose what information you share. Currently, this programme only works with two US insurance providers, but the company said we can expect a rapid growth similar to the thermostat roll-out. So, there was a lot of new information to take in, have the company impressed, or where you hoping for more? Let us know on Facebook.